Pacific Education Institute (PEI) provides many FREE resources to support K-12 teachers in getting students learning outdoors. 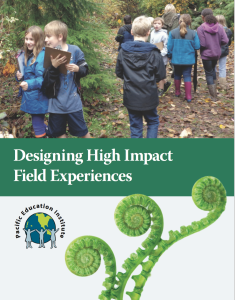 One of my favorite PEI resources is the Designing High Impact Field Experiences guide. This guide provides tools and resources to guarantee that a “field trip” can become a powerful learning experience for students. To download a FREE pdf of Designing High Impact Field Experiences… click HERE and then complete the information. This is a valuable resource for guiding any successful outdoor learning experience.